A calligraphy course was delivered at GTIIT on Jan. 28th to extend New Year's greeting to all GTIITers. Several couplets, wrote in different fonts by three calligraphy lovers, Cai Ruoke, Chen Qiacan,and Yu Yiran, were hanging on the wall. All the participants were welcomed to choose different scripts. Cai, Chen, and Yu taught the participants how to create their Doufang. 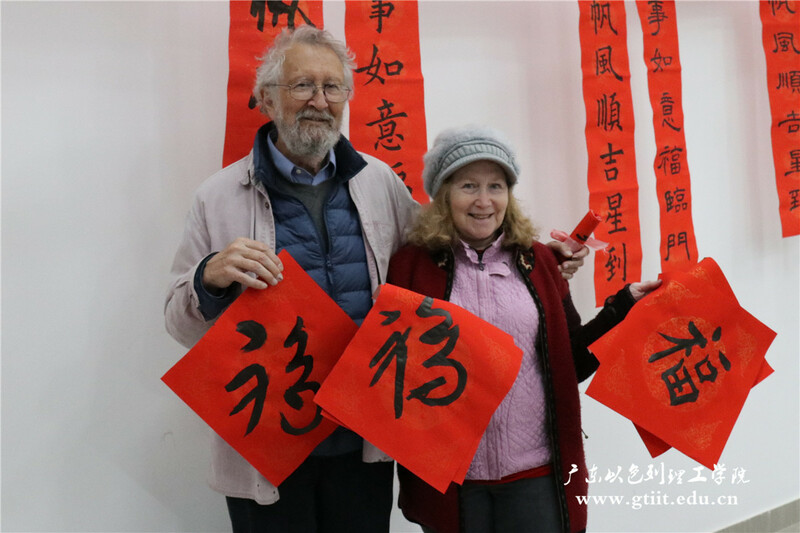 Bilingual instruction was offered so that participants can have a better course experience and know more about the traditional Chinese culture. Liu Jing, a freshman from Shandong, learned calligraphy for the first time. She said that it was very interesting to take a calligraphy course together with foreign teachers including Jamie and Ashok. "Introducing the customs of Chinese New Year made me very pround," Liu said. Yu Yiran, a native of Shantou, is the organizer of this event. "The Chinese New Year is approaching. I hope that this activity can extend best wishes to all GTIITers. We also prepared some couplets and Doufang for our teachers, wishing them a nice holiday," she said.